One of the very best benefits of artificial flowers is that they allow you to get really creative, without having to worry that your creation will wilt and die within 24 hours. You can use them all around the home to add colour and interest, high and low. On this page we’re showcasing some of our favourite artificial flower headboards to inspire you. 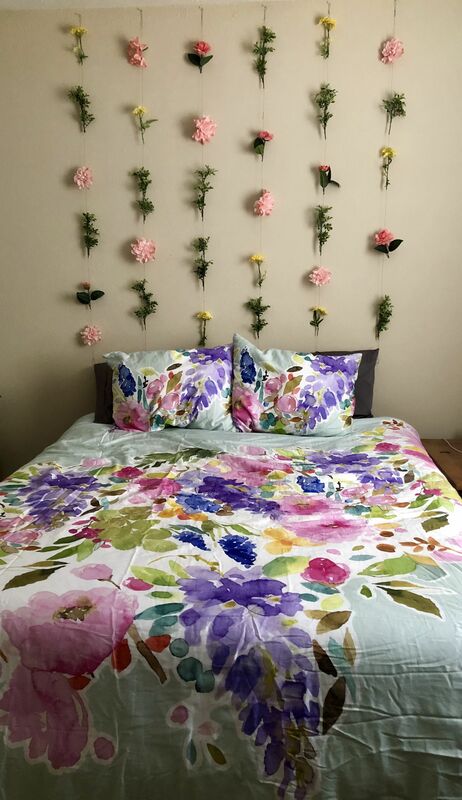 More than just your traditional artificial flower garlands looped across the top of the bed, these are truly artistic creative projects that add a unique and universally appealing floral display to the bedroom. We think the very best flowers for these projects are by a brand called FiveSeasonStuff – they really are incredible. Not only do the flowers look realistic (even up close) but they also feel realistic to the touch and some are even gently fragranced! We’ve seen a lot of fake flowers but those are the very best in our view and really well suited for creating a long-lasting artificial flower headboard like the ones on this page. Whether you use flowers, foliage or a combination of the two, we hope you’re inspired to put together something unique and wonderful to brighten up your bedroom. This pretty display uses single flowers and stems of foliage strung onto a length of thread that is hooked at the top of the wall. Incredibly easy to do but highly effective. This is an absolutely gorgeous abstract garland that uses real branches, leaves and berries to create a feature behind the bed. Choose artificial and your garland will last a lot longer! We absolutely love the use of a white branch to hold these strings of roses – and we think artificial peonies would be a great choice too! 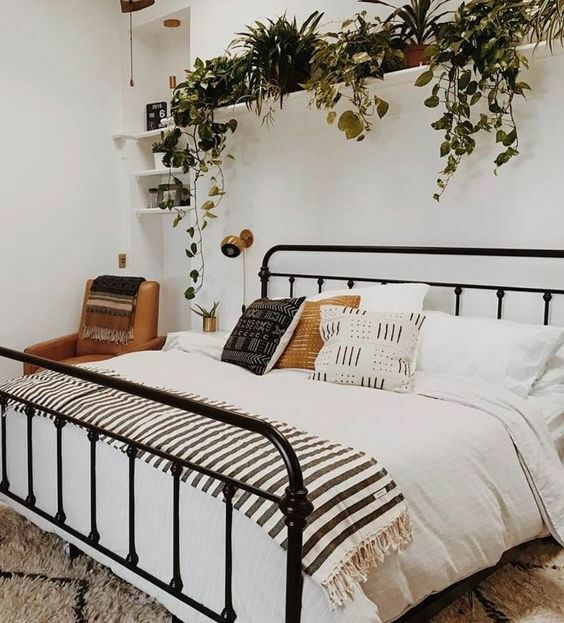 Although this isn’t strictly a headboard, we think the concept of a shelf of artificial plants with trailing foliage behind the bed works just as well! This absolutely gorgeous design for a headboard (or flower wall) comes from blogger Jenny at Sweet Teal, complete with a step by step tutorial to get you started. These beautiful roses which have been framed would make an absolutely perfect headboard for a plain bed. We’re absolutely in love with this stunning headboard which has been created by the team at Design Love Fest with a range of fake florals. This highly feminine design uses strings of artificial flowers, pretty lights and foliage to make an exuberant display. A lovely rustic twig forms the base for this hanging which would make a perfect headboard for a simple bed. The flowers are abstract but the design works because of their beauty. This delightful selection of brightly coloured artificial blooms has been strung together daisy-chain style to make a beautiful backdrop for a teenager’s room. There’s something incredibly simple and yet lavish about this choice of artificial flowers, attached on a very pretty metal hook and tied to each side of the bed. The beautiful panelling of this bedroom is contrasted by the shabby chic appearance of the floral display behind and roughly made bed. Whilst taping artificial flowers to a wall really ought to look awful, we think this looks beautiful and romantic. In the above photo, artificial foliage has been used to cover up an unsightly pipe – but we think the same design could be centralised above a bed to make an absolutely awesome headboard. There are lots of tiny lanterns available and you could use battery-powered tea lights with a warm glow for a further beautiful touch. NB: Most people are quite happy for us to use their images with a credit link. However, if you are unhappy with our use of your image or if you believe we have credited the wrong website, please leave a comment below (it will not be published) and we will correct the issue.